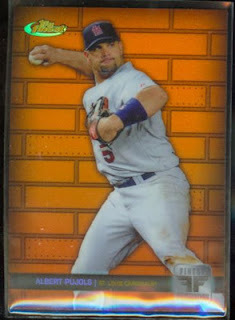 As we expect our case of 2011 Finest to arrive, let's take a look at some of the cards you might be able to get. 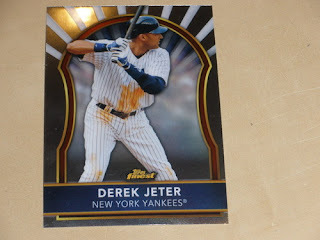 2011 Topps Finest baseball officially released today - although some of those sneaky folks put up auctions last night on eBay. Here is the base design. 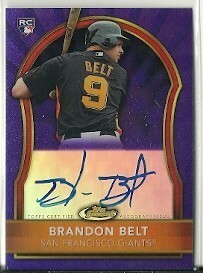 The rookie autographs cards also come in lots and lots of refractors such as this Brandon Belt purple, which is only numbered to /5. One of the differences in Finest this year is that it is released much later than it has in the past. I haven't seen any of the rookie redemptions Finest had in the past. If they are out there, I didn't see any yet, and that's part of the reason Topps moved the release back a couple of months. Eric Hosmer, however, still seems to be a redemption. Maybe a new addition - someone correct if I am wrong - are the jumbo swatches in Finest. We have seen this other products, but I don't really remember seeing them in Finest before. 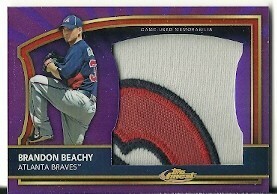 Here's an example with Brandon Beachy, also Hector Noesi has one as well. I did learn that searching for these cards is a little difficult on eBay unless you are searching for a specific player. There is a lot of Finest football and UFC out there and they all clogging the same stream. The base cards look like those bonus refractors that came in the Value Boxes earlier this year. I like the Finest Foundations insert set. Seems like something that would have come out in the late '90s. Maybe it's just nice to see an insert set that's not a mini or a reprint. LC is right, they look so much like the value box cards. I thought that looked familiar. The Foundations set looks okay. I wonder when Topps will finally get around to doing mini reprints. Crap, I hope I didn't just give them an idea.